Wigan moved a step closer to securing a home play-off semi-final with a hard-fought win over a spirited Wakefield. But coach Shaun Wane paid tribute afterwards to centre Dan Sarginson who played a full match just days after the death of his brother Adam. "It was tough for Dan and his family, but we dedicated that win to him," said Wane. "It was a huge effort for him to play. He just wanted to do what was right for his team." The news broke at the weekend that Sarginson's brother had died in Norway, but he wanted to play in his honour and had the backing of his coach and team-mates. "I've spoken to him all week," added Wane. "I spoke to him when he was in Norway and he never had any consideration for himself. "I'm happy with the win considering the emotion, the emotion of winning against St Helens and for what has happened with Dan. "It's been a very emotional week for everybody." Oliver Gildart and Sam Powell helped put the Warriors 10-0 up after 20 minutes. Wakefield refused to buckle - Tom Johnstone scored an impressive breakaway try as Trinity had a number of chances to score before Sam Tomkins' drop-goal on the stroke of half time. Bill Tupou's try brought Trinity close, but Morgan Escare and Joe Greenwood went over in the final quarter. 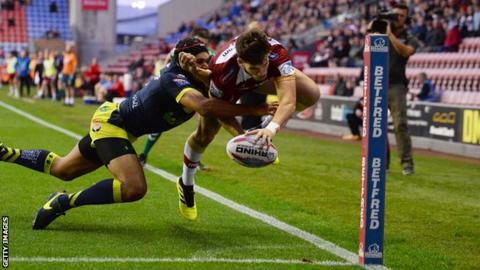 The win helps second-placed Wigan keep up the pressure on leaders St Helens, who are four points ahead with a game in hand, while sixth-placed Wakefield can now only focus on fifth place. Without the injured David Fifita and Kyle Wood, Wakefield lacked some creative spark, while Warriors welcomed back talismanic full-back Tomkins. The England international had a hand in the opening try after great work by Thomas Leuluai before Powell snuck in from dummy half from a metre out for the second. Joe Greenwood could have further extended Wigan's lead, but the second row was held up after crossing the Wakefield line. Matty Ashurst was sin-binned for a dangerous tackle shortly before the break, but his Wakefield side struck next as Johnstone ran the length of the field after intercepting 10 metres from his own line to score his 21st try of the season. Tomkins kicked a penalty soon after the restart, before Wakefield scored the first second-half try as Bill Tupou finished well in the left corner. The home side dominated territory and possession as the half wore on - Romain Naverette and Greenwood were both held up just after the hour mark - while Trinity were again reduced to 12 men when Scott Grix was sin-binned for a dangerous tackle. This time Wigan took advantage of the extra man as Escare slid in by the left corner after picking up George Williams' kick through the Wakefield line. Greenwood then forced his way over late on. "We were ill disciplined. I thought it was a real tough penalty count against us tonight. Quite a lot of them were penalties, but there were some real tough ones. "We were our own worst enemy tonight. Our discipline wasn't good enough and credit to Wigan because they found a way to win." Wakefield: Grix, Jones-Bishop, Lyne, Tupou, Johnstone, Miller, Hampshire, Arona, Randell, Huby, Batchelor, Ashurst, Crowther. Interchange: Pauli, Arundel, Hirst, Annakin.